Until recently, protein–protein interactions (PPIs) were seen to present contact surfaces too broad and featureless to give newly developed PPI-modulating drugs much purchase. Developers of such drugs, however, have become more optimistic of late, thanks to the availability of new tools and technologies for characterizing PPIs, screening PPI-modulating drugs, and monitoring PPIs to assess the quality of biologics and biosimilars. PPIs are highly specific electrostatic attractions between protein structures. These attractions may occur within individual proteins, resulting in globular structures, or between multiple proteins, resulting in complexes or aggregates. By determining whether structures or complexes that participate in cell signaling stay together or fall apart, PPIs regulate cell function. Besides influencing homeostasis, development, and physiology, PPIs also participate in disease mechanisms, which means that PPIs have significant potential as therapeutic targets. By characterizing PPIs, researchers can improve our understanding of cell function, and developers can expand our store of biologics and biosimilars. As these products progress to commercialization, developers may use PPI characterization to confirm protein stability and quality during formulation and manufacture. Because PPIs are so important in basic research and drug development, tools, and technologies for PPI characterization are proliferating. PPI-focused drug discovery is challenging because it must encompass multiple target classes. Also, much PPI-focused drug discovery remains focused on the difficult task of finding small molecules that can disrupt large contact areas, notes Dirk Ullmann, Ph.D., global head, drug discovery services, Evotec. Even though PPIs often contain hot-spot residues that represent targeting opportunities, PPIs are still, in the main, flat and extended molecular surfaces characterized by poor binding affinity. Apart from biologics and protein therapeutics, natural products and macrocycles provide some potential from a chemical-matter perspective. Physical interactions among proteins can be detected if associations between the binding partners lead to the production of readily observed readouts. Compared with biochemical and biophysical studies, evaluations of protein interactions in cells or living organisms require a wide panel of unbiased assays and detection platforms. Consequently, an integrated approach, says Evotec, is needed for screening and molecular-interaction analyses. Challenging PPI inhibitor projects have prompted the development of new reagents, assays, biophysical techniques, and computational chemistry applications. These versatile tools, together with medicinal chemistry expertise, are helping developers of PPI-modulating drugs improve their ability to convert hits into leads. Examples of PPI-relevant techniques include homogeneous time-resolved fluorescence (HTRF) spectroscopy, the AlphaScreen assay (PerkinElmer’s bead-based, nonradioactive Amplified Luminescent Proximity Homogeneous Assay), radiometric enzyme assays, high-content imaging, nuclear magnetic resonance spectroscopy, surface plasmon resonance (SPR) imaging, and size-exclusion chromatography/mass spectrometry (SEC-MS). An additional technique, fluorescence correlation spectroscopy, is the basis of Evotec’s proprietary FCS+plus platform. In the future, novel chemical matter with extended and 3D-shaped surfaces will better probe the nature of the low-affinity binding interactions inherent to PPIs. Evotec’s 800,000-plus compound screening library presents a fertile and accessible physicochemical property space, one that includes ligand efficiency and 3D fragment sets for complex targets driven by higher concentration screening. Approximately 25,000 molecules are comprised of a mixture of pure natural products, semisynthetic compounds, and macrocycles with a particular focus on PPIs. In proteomics, a directed approach is used to examine PPIs if the interaction is suspected or known, whereas a discovery approach begins with a protein of interest (POI) and seeks to identify interactions from among the wider proteome. The directed approach is supported by companies such as Rockland Immunochemicals, which has a long history supplying quality validated reagents. Rockland has also been emphasizing the discovery approach, through its partnership with AVMBioMed, a contract research organization specializing in the discovery of post-translational modifications. “The most biologically interesting interactions are often transient, which complicates their discovery, and explains many false-negative results,” says Christian Loch, Ph.D., AVMBioMed’s CSO and CEO. “The cell is a very crowded environment. With so much constant and nonspecific contact, many proteins stick to each other, if only momentarily, and get identified as interactions in a false-positive manner. Rockland/AVMBioMed offers traditional proteomic services, such as immunoprecipitation tandem mass spectrometry (IP-MS/MS) and SPR along with Snapshot Proteomics. Every technique has benefits and trade-offs. IP-MS/MS is often used, but for discovery, MS involves competition at a detector and is biased toward identification of the most abundant proteins and may miss the most transient and interesting interaction of the POI. Regardless of technique, all proteomic screens are differential and require two samples (IP and mock IP, or POI/wildtype and POI/knockout, for example) if changes relevant to the manipulation are to be detected. Amenable to a biochemical or cell biological approach, Snapshot Proteomics utilizes recombinant-purified proteins or genetically manipulated lysates. The underlying technique, the extract-based functional assay, was first described in 2009 by Yifat Merbl and Marc W. Kirschner, in an article published in the Proceedings of the National Academy of Sciences. 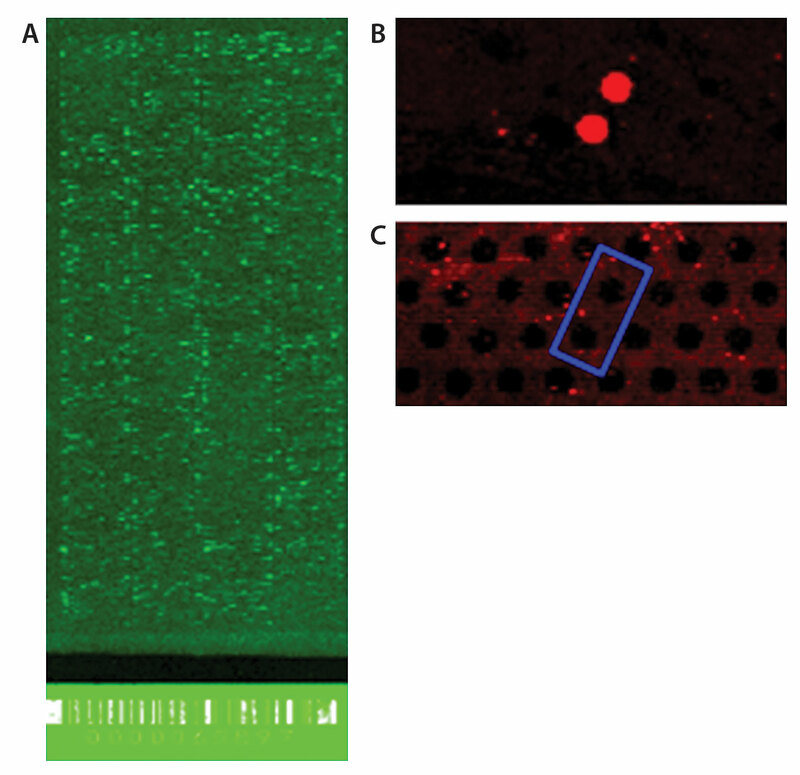 The microarray contains 23,000 purified recombinant proteins, including splice variants, spatially arranged, in duplicate plus controls, and excels in PPI discovery among low-abundance proteins, interactions that are particularly transient, and enzyme/substrate interactions involved in post-translational modification. Snapshot Proteomics, a technology developed by AVMBioMed, utilizes massively high-content protein arrays. (A) A protein microarray containing >20,000 purified human proteins Cy3 visualized for total protein. (B) One array was incubated with protein of interest (POI). (C) Another array was incubated with buffer alone. After incubation, both arrays are probed with anti-POI antibody, and visualized with Cy5-conjugated secondary antibody. The red indicates interaction between the immobilized prey protein (printed in duplicate) and bait POI (controlled for antibody cross-reactivity). Compounds that can modulate PPIs and, potentially, serve as therapeutics are not only hard to discover and design, they are also hard to identify in screening assays. For example, PPI modulators escape detection in conventional screening assays, which are designed to identify compounds that bind to the catalytic sites of enzymes, not the broad contact surfaces of PPIs. Alternative assays that may be more effective include SPR assays, which typically require specialized instrumentation, such as the Biacore SPR systems provided by GE Healthcare Life Sciences. In SPR assays, no labels are needed. Target molecules are immobilized on a prepared gold sensor surface, and then, through a series of flow cells, a sample containing a potential interacting partner is injected over the surface. The reaction takes place on a small sensor chip that allows for very small sample volumes and readily integrates with automation and high-throughput screening. 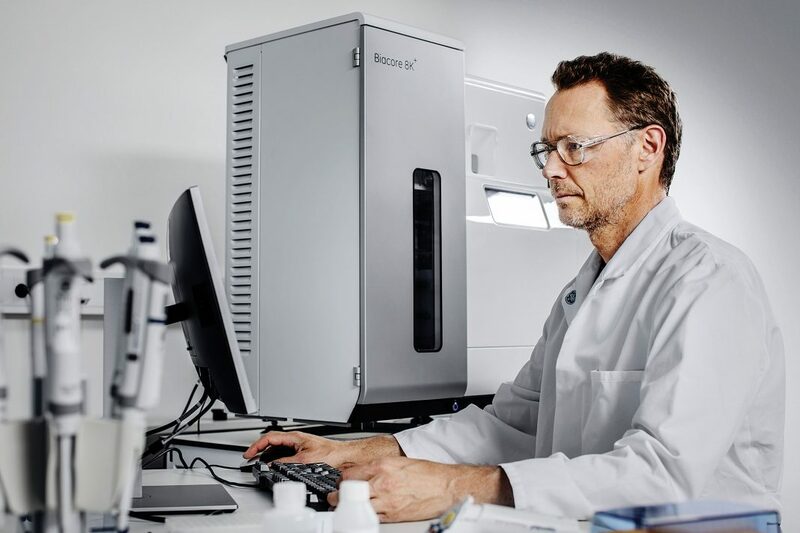 Biacore 8K and Biacore 8K+ SPR systems offer the throughput to screen large libraries of compounds to identify unique chemical entities. These systems also incorporate new injection types that are designed to find binders to novel binding sites or allosteric modulators much earlier than was previously achievable. ABA-injection, for example, allows two different solutions to be injected sequentially, as follows: solution A, solution B, and solution A. Kinetic data and concentration information identify false positives early so that only quality hits move forward. System capacity is up to twelve 384-well microplates, and up to 2300 molecules/day can be screened. Seventy-two hours of unattended run time with queueing abilities and rapid multirun evaluation minimize instrument deadtime. Advanced analytical tools provide an integrated workflow solution. The increasing complexity of targets and biotherapeutics adds to the associated analytical burden of quantifying safety, purity, and potency in quality control and manufacturing. To help Biacore users handle this burden, GE Healthcare Life Sciences recently released Biacore Insight Evaluation Software, an integrated, modular platform that can accommodate add on functionality for specific needs at any stage of the development process. Performed in nonflowing liquids, measurements allow the formation of stable complexes and consume low sample volumes. To help research and development investigators quantify binding events, NanoTemper provides a fast, easy-to-use biophysical tool called Monolith, which uses microscale thermophoresis (MST) technology. With Monolith, the interaction strength between a fluorescently labeled or intrinsically fluorescent sample and a binding partner is measured during application of a temperature gradient, and kd values are provided. Flexible in assay setup, Monolith can allow the addition of various binding partners and the assay conditions changed to understand interactions with multiple partners. Another protein evaluation challenge, one that becomes more pressing as more and more biologics or biosimilars are developed, is the characterization of thermal unfolding, chemical denaturation, and aggregation. To meet this challenge, NanoTemper developed the Prometheus instrument, which can be used from early development through formulation and production. The instrument uses nanoDSF, a form of differential scanning fluorimetry (DSF), to detect small changes in tryptophan fluorescence, which is present in virtually all proteins. Prometheus provides unfolding temperatures (Tm and Tonset), critical denaturant concentrations (Cm), free folding energy (ΔG and ΔΔG), and aggregation results (Tagg) using small sample amounts at low or high concentration and different viscosities. To provide a general-purpose workhorse instrument for any laboratory that works with proteins, NanoTemper developed the Tycho instrument. According to NanoTemper, Tycho tackles the reproducibility crisis in the verification of protein quality by analyzing the structural integrity, or foldedness, of proteins. As a thermal ramp is applied, the changes in intrinsic fluorescence from tryptophan and tyrosine residues in the protein are measured, which indicate transitions in the protein’s folding state. To test activity, a binding partner is added. NanoTemper Technologies provides tools that can assess binding affinities, protein stability, and quality. In biologics or biosimilars workflows, all the tools—Tycho, Monolith, and Prometheus—can cover certain discovery and characterization activities. Monolith can also cover scale up and manufacturing, as can Prometheus, which can also cover production. “Biologics are highly complex, finely tuned, and delicate molecules that require loads of characterization to get them to market,” says Taegen Clary, vice president of marketing at Unchained Labs. “Many of today’s tools rely on a single measurement mode, making it difficult to see how events like protein unfolding or self-association can lead to aggregation. Unchained Labs combined several detection methods—full-spectrum intrinsic fluorescence, static light scattering (SLS), and dynamic light scattering (DLS)—in an instrument called Uncle. It can measure up to 12 different stability, self-association, and aggregation parameters. The platform can apply a temperature ramp and simultaneously measure the unfolding temperature (Tm) and the onset of aggregation (Tagg). It can also assess aggregation parameters before and after the thermal ramp. The diffusion interaction parameter (kD) and the second virial coefficient (B22) can be concurrently measured to determine a protein’s self-association. To assess at high protein concentrations, the Kirkwood-Buff integral (G22), which accounts for protein-crowding effects, provides another indicator of colloidal stability. To quantify protein stability with Gibbs free energy (ΔG) another platform, Hunky, tracks unfolding as a function of chemical denaturant concentration. Because Hunky takes two ΔG measurements, one at low concentration and another at high concentration, the instrument can determine the aggregation risk of the protein along with the aggregation pathway. The identity of subvisible and visible particles helps determine the root cause of a potential aggregation problem. To help users identify particles and determine their morphology based on size and shape Unchained Labs developed the Hound instrument, which incorporates automated microscopy and Raman spectroscopy technology. Hound can chemically identify particles and confirm whether it resulted from protein aggregation or the intrusion of a contaminant. Laser-induced breakdown spectroscopy identifies metal and inorganic particles. The Uncle system, from Unchained Labs, can simultaneously measure Tm and Tagg for a monoclonal antibody, indicating when unfolding leads to aggregation. Uncle can also carry out dynamic light scattering measurements of aggregation before and after the thermal ramp.